Greyhounds retire from racing for a variety of reasons. Some may lack the drive and competitive nature to race and are retired at a young age. Others may have had a long racing career, but grow older and slow down. Some sustain muscle tears or sprains that may impact their speed and ability, and racing greyhounds also have face broken bones and torn ligaments. For the vast majority of these dogs, it’s the end of their racing career. 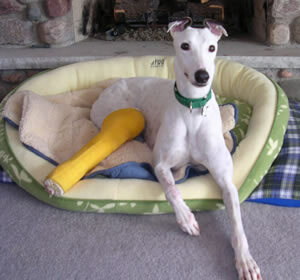 These injured greyhounds can make a successful recovery with proper medical care and enjoy normal running and romping around once they have healed from their injury. Time, money and dedicated foster homes are necessary to rehabilitate these dogs. GPA-WI is fortunate to work with skilled veterinarians to repair these injuries at a reduced cost. Foster homes are always needed to help these dogs recuperate and make return visits to the vet for cast changes and follow-up x-rays. 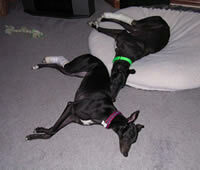 GPA-WI maintains a separate fund for greyhounds that need exceptional veterinary care. Known as the Blue Fund, this fund was established in 1997 to memorialize a wonderful greyhound named Blue who died unexpectedly at the age of seven. Silly, friendly and gentle, Blue was loved by all who knew him. His memory, and that of other loving dogs, gives life to greyhounds who might otherwise not get the chance. Since its inception, the Blue Fund has allowed GPA-WI to take in injured dogs, pay for their veterinary care and place them in loving adoptive homes. Funding is always a concern, and your contribution to Blue Fund can help this program thrive. Your donation will help our special needs or emergency medical needs of greyhounds coming into our adoption program. Helping just one greyhound won’t change the world, your help will change the world for that greyhound! Thank you for your support. If you wish to make a special donation, perhaps in memory of a beloved animal or person, please indicate the animal or person’s name, and the name and address of the person who should receive the memorial card. If paying through PayPal, you can include this in the “message to seller.” All donations are acknowledged with a card notifying the person in whose name the donation was made.